The BoxEdit command edits objects according to their bounding box size, orientation, and position. New bounding boxes are calculated each time the settings are applied. When in individual transform mode, you can type a value (instead of scrolling) to set a value for all objects (absolute vs. relative). The edit controls can use units other than the model units. Or, click Reset to reject the changes. Reports the number of objects selected. Rejects the changes and revert the objects to their previous state. Use any units to specify sizes. Specifies the x, y, or z size in model units. Sizes all three coordinates using the same value. Increment used by the spinner controls. Specifies the x, y, or z scale factor. Specifies the x, y, or z position in model units. Specifies the x, y, or z rotation in degrees. Note: The precision of the x, y, z values in Size, Scale, Position and Rotation are controlled by Unit Display Precision. Specifies which axis to use to set the direction being used for uniform transforms. Sets the base point for scale and rotate transforms. Uses the bounding box of all the selected objects or the bounding box of individual objects when Transform individual objects is checked. Uses the gumball pivot point to transform objects. Forces objects to be transformed individually. Selected objects that are not blocks use individual bounding boxes. Sets the x, y, or z location. Uses the minimum bounding box x, y, or z point. 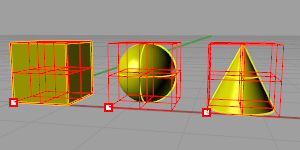 Set X, Y, and Z to Min to use the "lower-left" corner of the bounding box as the pivot. Minimum x, y, and z. Uses the centroid bounding box x, y, or z point. Set X, Y, and Z to Cen to use the "middle" of the bounding box as the pivot. Center x, y, and z. Uses the maximum bounding box x, y, or z point. Set X, Y, and Z to Max to use the "upper-right" corner of the bounding box as the pivot. Maximum x, y, and z. Uses world coordinates for the transformations. Uses construction plane coordinates for the transformations. Transforms each object from its own pivot point and bounding box. Individual bounding boxes and pivot for each object. By default, selected objects are all contained in one bounding box and are transformed from one pivot point as one unit. Single bounding box and pivot for all selected objects. Displays a control polygon that represents the bounding box. Transforms a copy instead of the original objects. Leaves the copied objects selected. This allows incremental changes to the copied objects.